Have you heard of qi wireless charging? I'm trying to get my S4 set up so that I can charge it wirelessly at work. Wires are the last thing I want to deal with on my desk when I have stacks of papers everywhere and qi charging seems so convenient. I need to find a qi pad for a decent price and if you see one, please let me know! 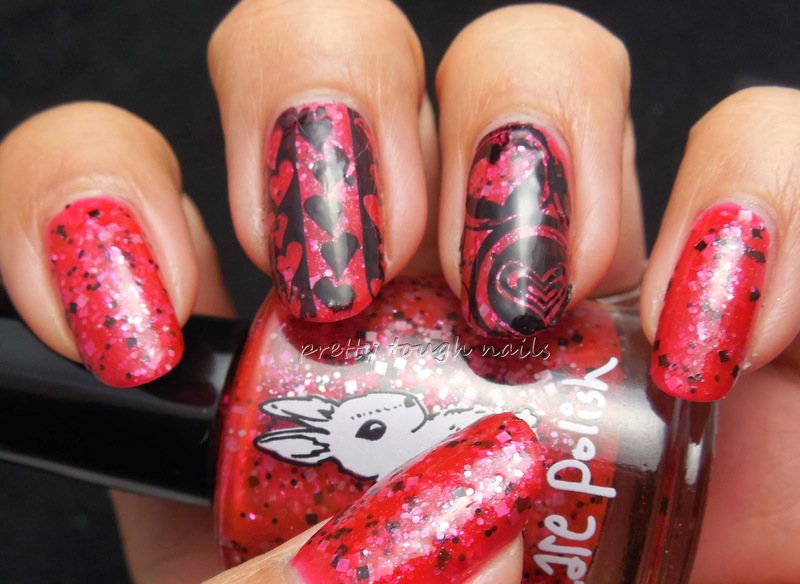 With Valentine's day quickly coming upon us, I felt Hare Polish The Red Room was a perfect prelude for the holiday. The Red Room is from the recent Twin Peaks collection, and it's a squishy red jelly with matte white squares, matte black squares and microglitter, along with white flakies and shimmer. Formula was smooth and easy considering the jelly base, and in contrast with Hare's normal formula of glitter overload, this was less burdened with glitter and I felt after two coats that the glitter was too sparse despite the base being sufficiently opaque. I was happy with the amount of glitter after the third coat, and after drying to a satin finish, I used GlitterDaze Super Smooth to add shine and smooth out the bumps. I ordered the newest set of Pueen plates the other day and felt that it would be a great opportunity to try them out. I like these plates because the patterns fill up the entire plate, similar to MoYou UK plates, but instead of rectangle plates, these are the standard small round plates. I used my standard WnW black creme and found that the images didn't transfer as smoothly compared to my other plates. Hopefully its a one time fluke. The image on my ring finger didn't transfer well at all - after getting onto my stamper I had to use acetone to clean the image up. It dried during that time so I had to make a decal or if it. Not cool. Despite all the hassle I do like the way it turned out. The Red Room works as the perfect background red for the hearts in the Pueen image. I'm not huge into celebrating Valentines but I think the black accent makes it not too corny valentines-y. Are you going to do any special nail art for the upcoming occasion? Enabler! Why is it that every time I try to resist buying a Hare Polish simply because it's a Hare, your swatches make me fall in love with it? I thought I didn't need The Red Room, but now I think I do. 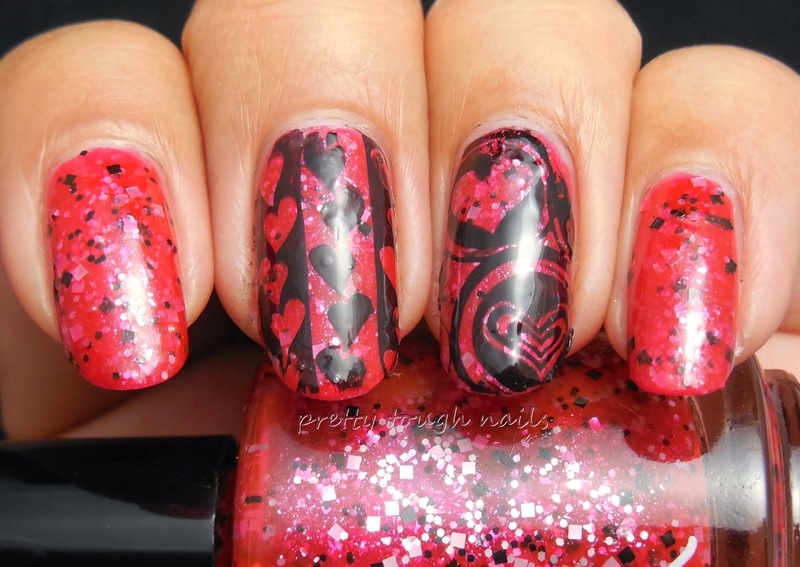 Nikole doesn't make very many red polishes, and this looks SO COOL! I actually don't mind this red! It's really pretty and I think the fact that it's a Hare makes me like it even more. Her polishes are always amazing. 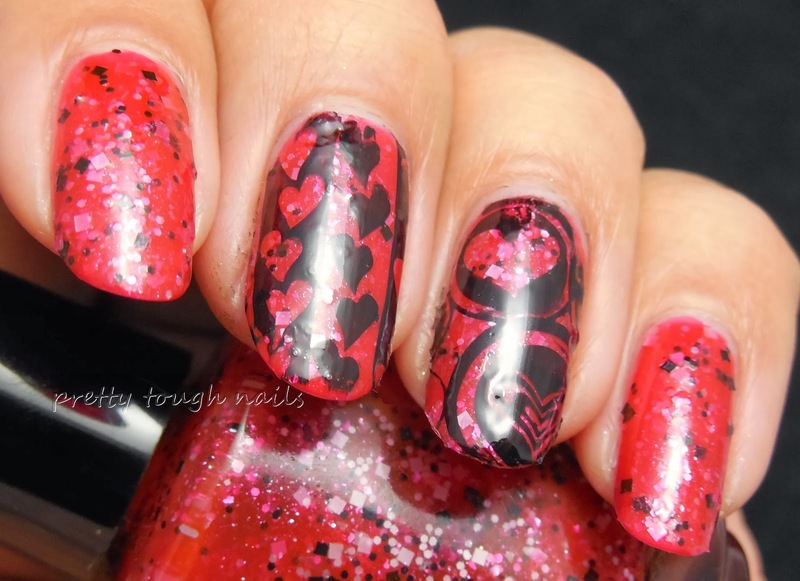 Your stamping on top totally makes me feel like it's a Queen Of Hearts mani. I love it!